After anticipating and getting ready for a 30 knot downwind flyer we instead had a long uphill light air slog which we finally retired from this morning into Santa Cruz. At the start we tested out the reefing and led both reefs just in case even though the lastest forecast was for it to lighten and become a beat but hopefully not till we were done. We also did 3 man overboard drills under sail with different drivers – lots of boats were staring at us…. I was all dressed up in my drysuit as the forcast looked like it was going to be a wet ride – I was all dressed up with no where to go! Rob came from Idaho and helmed the start doing a great job (port tack at the pin) – that’s us way out front at the other end of the line red boat. Chris drove up from Orange County and did jib trim. We did well in the fleet up to the North Tower and our first mistake of the race was to split the difference – some boats went Marin shore working their way against the flood (they did very badly). The main fleet worked the Mile Rock shore and did well. We did part Marin and then hit Mile Rock beach were there was early ebb hence the gain the fleet made on us. We were still however, up with the 40 footers although we couldn’t point like them and the wind was around 15 knots. We turned left and there was no cracking off in fact the breeze just kept on backing and getting lighter. 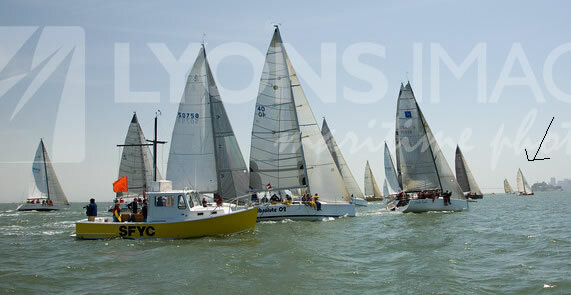 We were in with about 8 boats – White Dove, Phantom Mist, an Elan 40, Sapphire and quite a few others. Short tacking the shoreline seemed to be the way to go. Dinner of chilli and rice which was eaten out of the dog bowls but unfortunately we had made a tactical error and left the cutlery in the car – lids of coffee mugs work great as spoons! We turned on the nav lights as the sun went down and had to replace one of the bulbs (good thing we had extras). At 11pm Gus and I handed over to Rob and Chris. We had been short tacking to within .5 miles from the shoreline and only out as far as about 2 miles. It was very hard work as the instruments were playing up – every time you tacked you had to reset them. I know relying on instruments is not a great thing to do but with no moonlight and the swells pushing the boat into the wind making you think you were pinching they were a help. 6 miles before Pigeon Point we split tacks with the 40.7’s and went an extra .25 miles offshore of them before tacking back onto starboard. To our delight we killed them there was a right hand shift that lifted us to about 1/3 mile ahead of them from having been about 1/4 mile behind. However, the extra 7 feet of waterline paid off and despite tacking above their line we fell below White Dove and ended up in their lee with them passing within 1 1/2 boat lengths of us to weather. They were yelling out asking who we were. We tacked away to get out of their lee and stopped pretty dead with the swells on our nose it was a hard tack to steer. We ended up ducking hard around the starboard tack Elan probably could have made it but it was too close at night. The Synergy 1000 did not have nav lights showing which was very disconcerting and unsafe. It was really really cold out there last night. When I went down the batteries were at 11.7 and I mentioned needing to charge sometime soon. What we didn’t know but I was nervous about as there are only two AGM’s onboard is that there are not seperate service and start batteries so when you are on 1 on the battery switch you are draining both batteries. Bad news for us when I woke up 2 hours later to hear the engine trying to start. The voltage was down to 9.7.We pulled out the tools and turns out there is no way of hand cranking the engine, we tried flicking the compression switches but nothing worked. So that was the end of electronics, lights etc. We turned everything off and pulled out the battery powered nav lights which we strapped to the stern and bow – good thing we had just bought those from Svends. Then it was handheld GPS and flashlights to look at the windex – oh what fun!! So when the sun came up everyone had got away it wasn’t safe to stay short tacking the shore without depth and an engine so we had to stay further out where it turned out there was a lot less wind (we found this out after talking to people who finished) – White Dove got in before 10am which was when we were pulling into Santa Cruz. The owner Wayne woke me apparently Chris, Wayne and Rob were all chicken about coming down to Ãsk’ me about retiring. They made the decision to retire and then Chris and Rob told Wayne he had to come tell me! I told him it was his decision – he is the client if it was Rob or Chris I would have told them Perrin’s don’t retire and to stop being a weanie – but I don’t know Wayne well enough yet. We decided to give the engine another go flipping the compression switches, pouring fresh boiling water over the batteries to warm them up etc. No good and we gave up not wanting to fry the starting motor. So we sailed into the fuel dock at Santa Cruz mis judging the momentum and falling a boat length short of the dock going sideways towards shore away from the dock. Quickly we unfurled the jib and backwinded it spun in the turning area and set ourselves up for a better landing. Quick boat clean up, plug the batteries in to charge, breakfast at Aldo’s, fill up the boat and delivery jerry’s with diesal, hook up the autopilot and we pushed Rob and Wayne off the dock to deliver up to Half Moon bay tonight and finish it off tomorrow. Meanwhile I drove home with Chris’s wife Julie (and the rest of the crew)who stayed the night in a hotel room in Monterey on her own waiting for us. You had to be there to think this is funny but it took 3 of us from the crew to get Gus’s boots off at my house and required the use of a screw driver – I will leave that to your imagination. We learnt more about the boat and the job list got longer – batteries being on the top and the wiring of them. Back home and now off to work tomorrow reinforcing stanchions on a J105. Thanks to UK Sails for rush building us a bullet proof spinnaker which unfortunately we didn’t get to use. Hope you have a good memorial day weekend!